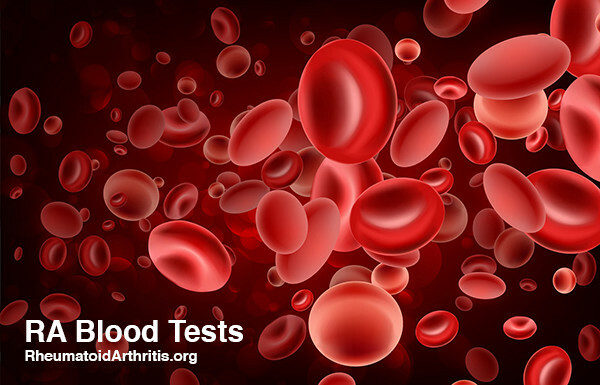 RA Blood Tests: What Lab Tests Show Rheumatoid Arthritis? To diagnose rheumatoid arthritis there is no one test that can on its own reach a diagnosis. Instead, there are a number of criteria that must be established in order to reach a rheumatoid arthritis diagnosis. As part of the criteria for diagnosing rheumatoid arthritis, doctors will order multiple blood tests. These blood tests look for specific indicators that support the possibility that the patient could have rheumatoid arthritis. None of these tests can singularly conclude that a patient has rheumatoid arthritis. Rather, doctors look at the combined results from all, alongside a number of other criteria including physical symptoms and genetics, in order to reach a rheumatoid arthritis diagnosis. Rheumatoid factor is a type of antibody found in an estimated 80% of rheumatoid arthritis patients. It’s an antibody that attacks healthy tissue and leads to joint inflammation potentially resulting in the development of rheumatoid arthritis symptoms. A rheumatoid factor blood test determines the level of rheumatoid factor in a patient’s blood. Once the rheumatoid factor level reaches a certain range, the patient tests positive for rheumatoid factor. Years ago, doctors used the positive result of rheumatoid factor in a patient’s blood to firmly diagnose them with rheumatoid arthritis. If a patient showed signs of joint inflammation and tested positive for rheumatoid factor, then rheumatoid arthritis generally became the clear diagnosis. Since then, research has shown us that many people contain the rheumatoid factor antibody in their blood but that it can lead to different autoimmune or inflammatory conditions besides rheumatoid arthritis. This now makes the test considered less conclusive than it used to be. This discovery blurred the lines about what does and doesn’t constitute a rheumatoid arthritis diagnosis. Today, doctors are more cautious about diagnosing a patient with rheumatoid arthritis if they test positive for rheumatoid factor. Although, it can still be a strong indicator in many patient cases. After the research came forward about the fact that non-rheumatoid arthritis patients can have rheumatoid factor in their blood, doctors started testing for another antibody, the anti-cyclic citrullinated protein. The anti-CCP antibody is another antibody that leads to inflammatory symptoms that cause rheumatoid arthritis. Anti-CCP is thought to be present in anywhere between 60% and 80% of rheumatoid arthritis patients. Often the anti-CCP antibody will be found in patients’ blood anywhere from 5 to 10 years before they ever exhibit symptoms of rheumatoid arthritis. The presence of anti-CCP and rheumatoid factor in a patient’s blood provides a strong case for making a rheumatoid arthritis diagnosis, provided the patient’s symptoms are also clearly consistent with rheumatoid arthritis. Patients with rheumatoid arthritis suffer from inflammation in their joints caused by an autoimmune reaction. Doctors can actually measure the level of inflammation a patient is experiencing in order to help reach a rheumatoid arthritis diagnosis. The erythrocyte sedimentation rate (ESR) test is conducted on potential rheumatoid arthritis patients. In the ESR test, the technician takes a sample of blood and adds it into a tube. The test measures the rate at which the red blood cells fall and settle in the bottom of the tube. The rate is measured in millimetres per hour. A fast sedimentation rate indicates there is inflammation in the body. This is because inflammation causes the red blood cells to clump together, become denser, and fall faster causing them to settle more quickly. The ESR test is not used on its own to diagnose rheumatoid arthritis. It is just a helpful tool in allowing doctors to have a complete idea of what is happening with the patient. Like the ESR test, the C-reactive protein test also measures inflammation. CRP is produced in the liver and its levels are measured in order to determine acute inflammation. If there are high levels of CRP this indicates the patient is experiencing a certain degree of inflammation. A number of conditions, including rheumatoid arthritis, can cause high CRP levels. If a doctor suspects rheumatoid arthritis in a patient, the CRP test can be used to confirm that the patient is experiencing inflammation potentially cause by rheumatoid arthritis. CRP tests on their own cannot conclusively determine a rheumatoid diagnosis. They are used only as an indicator to help doctors to further narrow down a diagnosis. The antinuclear antibody test is used to help doctors identify the presence of an autoimmune disorder in a patient. This blood test helps identify the antibodies in a patient that attack the healthy proteins contained in the nucleus of cells and in turn cause symptoms like rheumatoid arthritis symptoms. These antibodies are called antinuclear antibodies (ANA). Some levels of ANA can be found even in healthy people. However, if high levels of ANA are present, it could increase the risk of developing an autoimmune disorder. When rheumatoid arthritis is suspected, some doctors look for ANA in their patient’s blood to identify the possible presence of an autoimmune disorder. Rheumatoid arthritis blood tests are only one way to help doctors reach a diagnosis. If a patient is positive for any of these tests, they must also exhibit specific symptoms of rheumatoid arthritis. Doctors look at multiple other criteria besides blood test results when determining their diagnosis. In some cases, patients can still be diagnosed with rheumatoid arthritis even if they don’t test positive for the various types of antibodies found in rheumatoid arthritis blood tests. Read more about diagnosing rheumatoid arthritis and the different types of rheumatoid arthritis here.